Transitioning back to work after an active, invigorating two-week vacation was hindered by the lingering effects of a sinus infection. My clergy colleagues were eager to support and took care of my assigned duties. Unexpectedly, I was worshipping without the responsibility of holding any details. I love to lead worship. I love to celebrate the Eucharist. I love to preach. Yet this day, receiving the gift of being carried by the liturgy as my colleagues skillfully led, and read, and prayed, and preached was a soothing way to re-enter after vacation. Since we had an abundance of clergy, out of an abundance of caution, I did not even participate in administering the Eucharist. Stationed behind the altar, I prayed as the incarnate manifestation of those stories bravely knelt, raised their hands and received the Body of Christ. I noticed that two people were next to each other who had each lost dear loved ones in the past year. I prayed they would experience the communion of saints present at the Eucharist–their loved ones present in this moment with them. As they rose, nearly simultaneously, the elder of the two–whose loss was a bit longer ago, gently put his arm around the younger, the one whose wound is quite fresh. Today was the first Sunday for our new organist, Kenneth Hamrick. Staff members who do not usually worship at the 10:30 service made it a point to come support Kenneth on his first day. I adore our former organist Jim Dorroh. Jim helped to install the organ at my former parish, played at my ordination. He will always be dear to me. There were many changes with the music today. All supported beautiful worship in my unmusically-trained opinion. I couldn’t help but smile when I looked to the choir loft and saw Kenneth exuberantly oozing his love of music, I dare say, love of God during the offertory anthem. He could not be contained as he played, “Sing to the Lord a new song!” (Ps. 96:1). I kidded Kenneth afterward that I was afraid he was going to bounce off of his bench, out of the choir loft, and tumble into the congregation. Kenneth’s love of music and people is infectious. Recently I have been challenged to defend the Church’s relevance in today’s world. Do we really make a difference? My experience today and so many days is “yes.” God is gathering us–to play and pray and cry together and laugh together. God is gathering us to study together and support one another and even call each other out when we are not living in accordance to the Gospel. God is gathering us to care for the least of these and share the bounty of gifts God has bestowed upon us. Together we find truths inaccessible on our own. Separate of community, there is a danger of making ourselves gods. God is gathering us. Welcome to the table. Amen. Early in my first year at Virginia Theological Seminary, I was approached by Joseph, a quiet priest from the African nation of Burundi. My classmate was young and towered over me in his thin, 7-foot frame. On the morning of the service, I regretted my “of course” because I was recovering from bronchitis, mid-terms were the next week, and I had paper due on Monday. I didn’t think Joseph and I were that close, I wondered if my participation really mattered. Thankfully, guilt, the wrong reason for going, prevailed. When I entered the small, brick church, there was a tiny contingent of students—Michael from Liberia, Joel, who some of you know from Kenya, and three other American students, all sitting in the front row. I slipped in next to them. Joseph stood up and expressed his gratitude for our being there, especially for the parish deacon, who had heard Joseph’s story, heard his lingering pain, and suggested this gathering in the service of healing. We listened to Joseph tell his story—the most tragic first person account I have heard in my life. When Joseph was a teenager, Burundi broke out in civil war between the Hutu and Tutsi clans. “Neighbor turned on neighbor,” Joseph recounted. On the morning of October 22nd, 1994 there were violent clashes in his village and Jospeh was told to take his younger siblings and hide in the basement. He heard his parents being taken from their home. When the violence subsided, when the screaming was over, when they lifted the cellar door, Joseph and his siblings re-entered the world as orphans. They never saw their parents again. “I knew when I accepted Jesus in my heart,” Joseph spoke as tears streamed down his face, “I knew I had to forgive my neighbors for killing my parents.” Miraculously, Joseph had forgiven his parents’ killers. What now haunted him, Joseph explained, what had haunted him all these years, was the fact that he had not fulfilled his duty as an eldest son in burying his parents. That, we learned, was the purpose of our gathering that day. After we prayed, after we celebrated the Eucharist, we followed the Deacon who carried the processional cross, out into the parish garden. We prayed prayers from the burial office, Joseph dug a hole and we planted a golden mum in memory of his mother and father. In Matthew’s Gospel, Jesus’ first sermon was the Sermon on the Mount, which begins with the Beatitudes—a bounty of blessedness which at first hearing doesn’t sound so blessed. One aspect of the Beatitudes is their relationship to location. Each of us is born into a particular time and a particular place into a particular family and a particular culture with a particular set of gifts and challenges. This is our time. This is our place. Where do we stand? If you have ever read or watched Tolkein’s Lord of the Rings Trilogy, you know that those tales take place in troubled times. There were wars and Frodo Baggins’ journey was epic in its danger and adventure. The Beatitudes helps us to set our hearts, and our voices, and our feet in the right place in the time that is given us. My classmate Joseph, chose reconciliation over retaliation.The deaconess who gathered us for that 17-year late burial service, chose compassion over complacency. Blessings are made real by the power of God working through our particular lives. Blessed ARE the merciful for they WILL receive mercy. Do you hear that bending of time—that already, but not yet? This interplay from now to that which is to come, is the hope and fulfillment of God’s promises to us. It is the hope of a man who has lived through the hell of civil war, who has seen men and women, at their absolute worst, and he still chooses love, he still chooses to forgive, and to dedicate his life to Jesus Christ as a priest in God’s church. In the Beatitudes, Jesus is beckoning us toward heaven. Perhaps that is why we read the Beatitudes on All Saints Day. We are reminded that the we are intricately linked with all of those who have gone before us—the Johns and the Judases, the Marthas and the Marys, the grandparents, and the children, and all of those who had their opportunity to be in a particular time and a particular place in which to live out their blessedness. All Saints’ Day is a stark reminder that one day, it will be our own name that will be read in memory. Thus the urgency for us to decide what to do with the time that is given us. What a fruitful time we live in to be the conduits for Christ’s blessedness. We are blessed to be a blessing. Everyone of us is blessed in God’s eyes—no matter our age, or country of origin, or physical capabilities, or GPA, or salary, or affiliations. We live out this blessedness in community because it is impossible to do it on our own. Notice how my classmate Joseph’s healing came in community.First, when as a refugee from civil war, he was introduced to Jesus by a community of faith that loved him, cared for him, and encouraged him to forgive his parent’s killers. And then by a community gathered to bury a golden mum in memory of his parents. We learn where to stand in community. We uphold one another when the world thinks we are so foolish to believe in the promises of Christ. Even when the world seems fractious and hateful and merciless we believe the promises of reconciliation, and wholeness, and mercy. Together we live into the already healed, but not yet visible restoration of all things in Christ. We believe that listening to one another’s stories, and planting golden mums makes a difference—that they are ways we awaken to the kingdom of heaven right here, right now. Jesus taught in community, healed in community, died in community, and was resurrected to a community. Christianity at its core is about relationship. The beatitudes give us the hallmarks of what it looks like to be Christian community. They help us to see if we are standing in the right place with the shared humanity Rich referred to in his sermon last week. You are in the right place, if like Joseph’s deacon, you listen to someone who is different than you, with a heart willing to be moved. You are in the right place if you are Care Team members offering presence, and prayers, and food; if you are teenagers stuffing bags for Stop Hunger Now; if you bring water to a homeless person in Linn Park parched by the summer heat. You are in the right place if you welcome the stranger into your heart and your home. You are in the right place if you are doctors giving heartbreaking news with mercy; if you are judges deliberating with justice and compassion; if you are advocates giving voice to the marginalized; if you are Kairos visitors bringing the Gospel to prisoners. We are in the right place if we are a community willing to foolishly believe that we can change the world one blessed heart at time. This is our time. This is our place, it is for us to decide what to do with the time that is given us.” Amen. Audio will be available here. While visiting the Redemptorist Retreat Center, I was standing beneath petroglyphs created by the Hohokam peoples more than a century ago and marveled at our timeless yearning to communicate with one another. Petroglyphs speak to an innate desire to share and shape our stories. Today, most of us use words and not markings to tell our stories. “We are to let our words be gifts and not weapons.” Karen concluded. Our words have energy. If we believe we are invited by God to co-create the beloved community, we are to examine how we use words to move toward that vision, and how we use words to move away from it. Words matter–silence matters too. Recently I was with a group of people who were belittling someone who has been good to me. I stood by silently, losing the opportunity to bravely use my words to defend a friend. I did nothing to transform the energy of ridicule toward the energy of love. There is a recent notion that we are not to take people, especially people in power, at their word. I disavow this cynical manipulation of words. If we cannot trust what a person says, posts, or tweets, how are we to understand him or her? Communication is the foundational basis of relationship. It is disingenuous to throw out words or promises or threats , and then ridicule those who take your words seriously by saturating the airwaves with more words to say you did not mean your original words. Slinging words around like hash in a pigpen and expecting the recipient to intuit one’s sincerity places a false sense of responsibility upon the recipient; and worse, falsely releases the word-slinger of culpability for the energy created by his or her words. I can’t control what other people do, but I can be more mindful of the power evoked by my words. I can own the truth that words not only tell, but shape our stories. I commit to be more discerning of how I use words, asking myself a question inspired by Karen’s insight: Are these words gift or weapon? I pray for the strength and wisdom to choose gift. I pray for courage to use my words to speak up when silence would mean allowing weapons to be aimed unabated. I hold out hope that ours is a God of transformation and redemption. I also believe we are invited into that process–individually and collectively. What will we choose? What words will we choose? A few years ago I was part of a team leading a spiritual retreat for people impacted by HIV/AIDS. Before one of the breaks, I offered to take a group to walk the labyrinth. To my disappointment, only one person chose to join me, and this person was someone I found especially challenging. I will refer to him as Jim. Jim frequently interrupted others when they were speaking. He lacked self-awareness; even his voice bothered me. I wanted to bail, but there was no polite way for me to do that, so we began the short walk to the labyrinth. Under the gaze of undivided attention, I found Jim to be significantly less irritating. I asked a few questions and learned a bit of his hard and heartbreaking story. 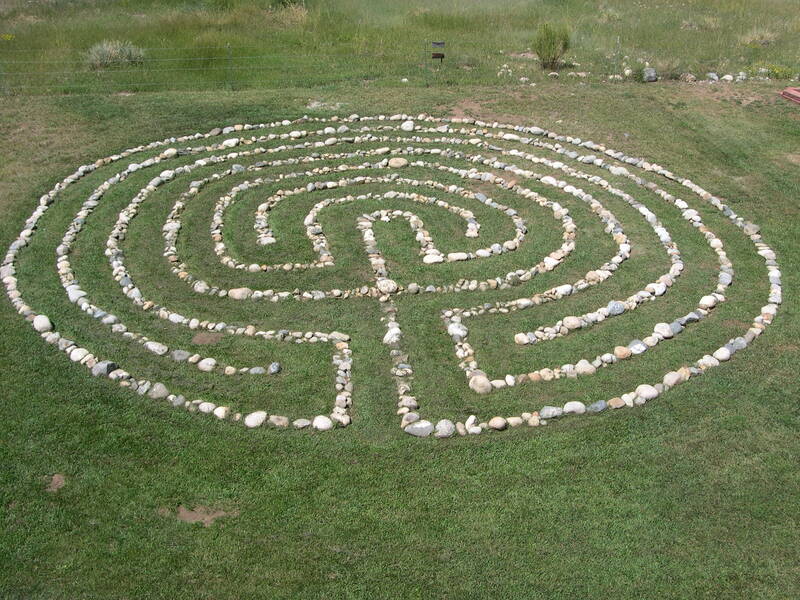 When we reached the labyrinth, we noticed it had fallen into disrepair and the path was not easily visible. I told Jim that some teachers encourage us to enter labyrinths with awareness of a three-step process. First, on the way in toward the center, we may create an intention of releasing something we would like to let go of. Second, we may simply receive while in the center. Finally, we can be aware of how we feel different, perhaps lighter as we return home following the path back out of the labyrinth. We began to walk slowly with Jim right behind me, but he was still afraid. I asked if he wanted to place his hand on my shoulder, and he did. We silently continued in this manner, Jim resting his hand on my shoulder as we trod the sacred path. When we reached the center I turned around to see a beaming Jim. He hugged me exuberantly. We celebrated; we prayed. As we turned toward home, I invited him to lead the way. Jim did not think that was a good idea, yet he relented. And so we silently traveled out, Jim ahead, me a short step behind, with my hand on his shoulder. When we reached the exit/entrance, Jim pumped his fist and we both cheered. On our walk back to the cabins, we laughed and listened to one another anew. Throughout the weekend, I noticed Jim was less irritating–I’m not sure if his behavior changed or my perspective of it, or both. Rather than avoiding him, I felt genuinely excited to see him. Could this be one way forward for us all? Is there someone, or a group of someones that get under your skin? A person or people that you judge, or to whom you feel superior? How might you create an opportunity to connect with that person, or one of those persons? What might you have to let go of to make space for connecting with those who are different. My arrogance and sense of self-importance threatened to prevent me from receiving the grace of walking with Jim. With whom are you being invited to walk in a new way? May we all have the courage to take the first step in love. Growing up I was greatly influenced by my Irish Catholic great aunts, the Sullivan sisters—Aunt Bea, Audy, and Aunt Katherine. Each of them lived long lives-well into their 90’s; Aunt Katherine actually broke the century mark. My siblings and I would kid about our great aunt’s secret to longevity which included beginning their days drinking hot water with lemon, and ending their days with a manhattan. A couple of years before Aunt Katherine died, my mother and I went to visit her. She was in an assisted living facility in Dallas. Aunt Katherine was legally blind, her hearing was impaired, and she spent a good bit of her time alone. The day we arrived, she was dressed in a lace blouse with a cardigan sweater. Ever the lady, she graciously invited us to sit down. After mom and I filled her in on our lives, and those of my siblings, there was a long period of silence. Aunt Katherine had a distant look as if she had left the room in some way. What I remember most about our visit with Aunt Katherine was that in spite of her diminished physical capacities, in the midst of what could have been uncomfortable pregnant pauses, there was a palpable sense of the sacred in that room. There was something about being in Aunt Katherine’s presence that stilled me, I felt unconditionally loved. She was a better hostess than she knew. I do not want to romanticize the loneliness that often comes with aging and especially aging alone. And yet, one of the greatest gifts of being a priest, is the honor I have of visiting people who no longer have the ability, and in some cases, desire, to be out in the world in an active way. They have reached a stage of life, or have been impacted by illness so as to be at home most, if not all, of the time. All have had to let go of things that they held dear— beloved family members who have died; meaningful careers, and life-giving hobbies. There can be a suspension of time when we are in the presence of those who have been forced to cease the forward motion most of us experience—God’s presence borne in the pregnant pauses; in the glint of love shining through eyes that speak for mouths that no longer move. For me, these visits are a reminder that if I live long enough, one day, I too will be sitting in a chair awaiting precious visitors. In the experience of suffering, we are especially reminded of the vulnerability and fragility of this life, and from this spacious, scary place, oftentimes, God’s love reveals itself. The Christ hymn we just read from the second chapter of Philippians speaks of putting on the mind of Christ. Within this mind of Christ is the humility Jesus exemplifies in emptying himself to become human, even though he could have been exalted as equal with God. Central to kenosis, the self-emptying love alluded to in this passage is Jesus’ first self-emptying when he became incarnate, and the second self-emptying, when he chose to endure the humiliation of the cross for the reconciliation of the world. For the record, I cleaned up Bolz-Weber’s language for this pulpit, but I find her original writing more effective than my sanitized version. What is the mess that is gathered up and blessed by Jesus? Our physical suffering, our emotional suffering, the pain we inflict on others, our selfishness, our meanness, our putting allegiance to idols, like career, or physical appearance, or political affiliation, or alma mater, ahead of our allegiance to the one for whom every knee shall bend and every tongue shall confess as Lord. All of our mess is gathered in God and transformed into love and mercy. Putting on the mind of Christ is a call to live into our birthright as the imago dei, we are the image and likeness of God—every human being individually, and we, collectively as the Church, inheritors of Jesus’ teachings through the power of the Spirit. Putting on the mind of Christ is a call to humbly empty ourselves to be conduits for Christ’s love. When I visit our friends who are frail, I am reminded that sometimes the emptying happens to us—we live in a world bound by the rough-edges of fragile human bodies, swinging financial markets, unpredictable weather, and other means of exposure to loss. God saves us from our pain. God saves us from our selfishness. God saves us from …you fill in the blanks. Yes, sometimes the emptying happens to us, and ALWAYS we are encouraged to humbly empty ourselves of those things which prevent us from putting on the mind of Christ. It is easy for us to be filled with self-righteousness, but that prevents us from loving or understanding those who are different than us. It is easy for us to be filled with a desire for accolades and attention, but that prevents us from encouraging the blossoming into fullness of those around us. It is easy for us to be filled with a desire for safety, but that prevents us from taking risks to make this a more just and merciful world. It is easy for us to be filled with a desire for power or control, but that prevents us from humbly seeing all persons as God’s beloved, and it inhibits the space for the Spirit to move within us. We are to empty ourselves in love as Jesus did. I know it’s not easy, that kind of love is always sacrificial. That kind of love is always filled with hope. That kind of love transforms the world. In his letter to the Philippians, Paul is writing from prison to a primarily Gentile community experiencing internal conflict and external persecution. Yet , There is a drumbeat of hope and joy throughout Paul’s letter. If you are looking for a New Year’s resolution I encourage to read Philippians in its entirety today. Imagine if we chose to “take on the mind of Christ” as our mission in 2017. Recently, I had the privilege of sitting with one of our Saint Luke’s members who is homebound . At the end of our visit, after conversation, after Communion, I moved to shake his hand good bye, he shot me a glistening spark of love from clear blue eyes. I felt as if I were seeing the very face of God. I felt beloved. Like my Aunt Katherine, emptied of many of the temporal things we value during our active phase of life, the light of Christ shone bright through him. I imagine that moment of grace was preceded by many filled with the painful struggle of one letting go after another. My time with him has sustained me this week. Knowing one day it probably will be me in that chair, I aspire to do so with the love and grace afforded me by Aunt Katherine, the gentleman this week, and so many others. In my few years as a priest, I have had the privilege of anointing with oil those who desire healing for themselves or for others. Sometimes the prayer is for healing from a physical ailment; sometimes from grief, or financial struggle. The list is endless because the kinds of suffering we experience is endless. I have also anointed the foreheads of those who are breathing their last, assuring them that they are loved by God, praying for the merciful forgiveness of their sins, that they will be released from suffering, restored to wholeness, and brought into everlasting life. These are sacred moments. Stripped of title, stripped of conventional physical beauty, stripped of all but one tenuous breath in and another tenuous breath out– pretenses drop away. Identification with power or tribe or bank account or beauty is meaningless in these moments. I have had the honor of anointing brown skins and white skins, Republicans and Democrats, people who are gay and straight, those who are rich and poor, young and old. I have not anointed any of different faiths or no faith at all, but I would if they wanted me to. The differentiating factors that we spend an inordinate amount of time using as ways to separate ourselves become immaterial when we are faced with the eternal equalizer–we all suffer, we all die. Rather than causing distress, this simple truth offers clarity and urgency to finding purpose and meaning in life. If you aren’t sure what your purpose is, what would it be like to make loving whoever is in your orbit your purpose? What about offering kindness and love to the difficult teenager in your family, the neighbor who lives alone, the grocery store clerk who seems tired and stressed? Maybe we can share with one another a bit of the grace we have all been given. Maybe we can practice dropping the pretenses now. Pledging allegiance to our shared humanity by reaching out to those we deem different than us. What if, instead of pre-judging and assuming we know what others think or believe or feel, we asked a few questions with a sincere desire to understand. What brings you joy? What do you fear? Who do you love? What do you believe? And then, what if we were to listen devoutly, without judgment, without interruption, without imposing our own story? What if we were to listen for points of intersection, rather than points of departure? On the precipice of a new calendar year I have hope that we can partner with the Divine to be the healing balm for one another we all desire.